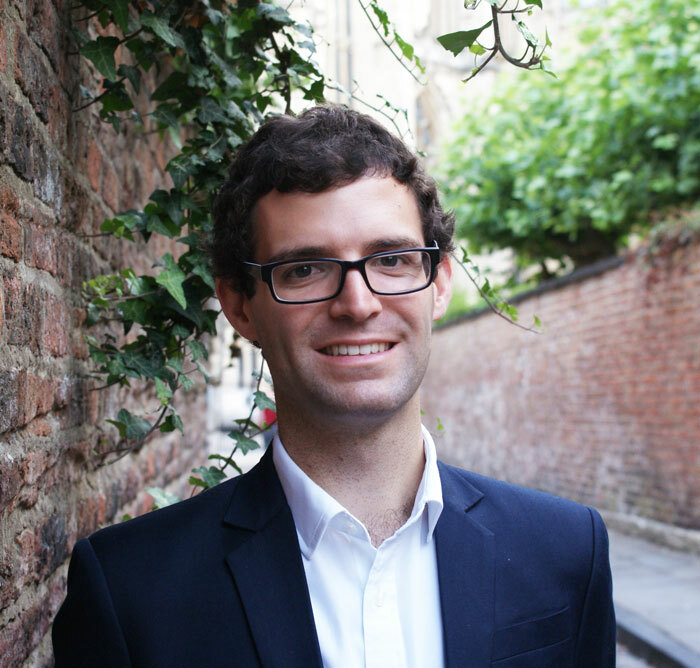 Benjamin Morris is Assistant Director of Music at York Minster, accompanying the choir in the Minster’s daily cycle of music, in concerts, tours and broadcasts, and assisting in the training of the boy and girl choristers. Benjamin was previously Organ Scholar and then Assistant Organist at Jesus College Cambridge, graduating with a double First in Music. During his time in Cambridge Ben appeared in services and concerts throughout the world, on national radio and on several CD recordings, and directed the College’s two choirs while the Director of Music was on sabbatical leave. Before starting university, Ben spent a year as Organ Scholar at Gloucester Cathedral. With recent venues including Westminster Abbey, Leeds Town Hall and Kristiansand Cathedral (Norway), Ben is regularly engaged as a soloist for recitals and other performances. He has performed as organ soloist under Sir Roger Norrington, Howard Shelley and Stephen Cleobury, and has played organ and harpsichord continuo alongside His Majestys Sagbutts and Cornetts, The Saraband Consort and Britten Sinfonia. He has studied organ with Gordon Stewart, David Briggs, Colin Walsh and Richard Pinel, and harpsichord at the Royal Academy of Music with Terence Charlston. Ben is a prizewinning Fellow of the Royal College of Organists. An experienced conductor and choir trainer, Ben regularly conducts York Minster Choir in services and rehearses daily with the choristers. Whilst in Cambridge, Ben spent a term running and directing Jesus College’s two choirs, and conducted orchestral works including Mozart’s Piano Concerto No. 20 in D minor and sell-out performances of Milhaud’s chamber opera, Le Pauvre Matelot. Ben has been Musical Director of the York-based Chapter House Choir since 2017.